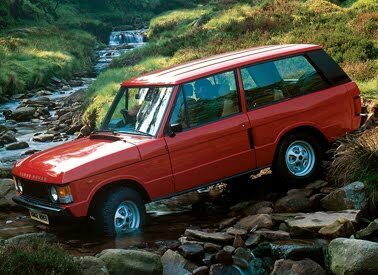 Because of the excellence of its original concept and design, the Range Rover has altered little since its inception, although a number of refinements have been, and are being carried out. Continous product improvements are planned over the next few years to keep it at the top of its market sector. In 1978, a significant investment package was announced. This is now well under way. Stage 1 of the expansion programme is complete, and has enabled Range Rover production to increase considerably. Stage 2 of the programme is now in progress, and will result in further increases in production to meet world-wide demand. 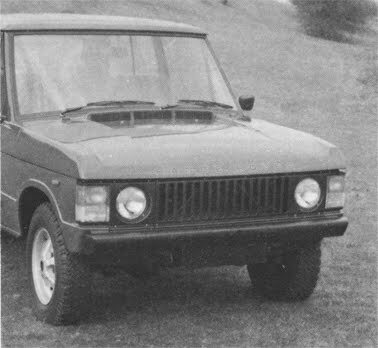 The Range Rover's origins can be seen as far back as the early 1950s when Maurice Wilks, Land-Rover's principal design engineer, mooted the idea of a 'Road Rover'. 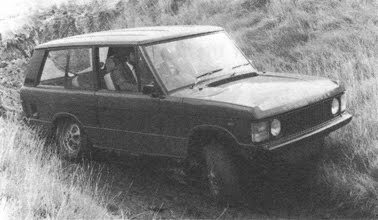 Initially conceived as a bigger and better Land Rover, it never progressed beyond the stage of test models, and the project was cancelled in 1958. 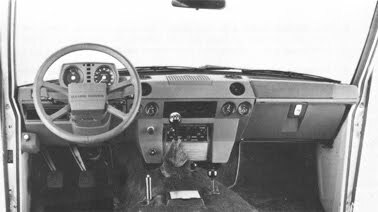 The idea of a luxury Land-Rover was taken up again in the mid 1960s by Spen King and Gordon Bashford, Chief Engineer and Chief Designer respectively of New Vehicle Projects, who set out to combine the practicality and cross-country ability of Land-Rover engineering with the performance and comfort of Rover saloons. 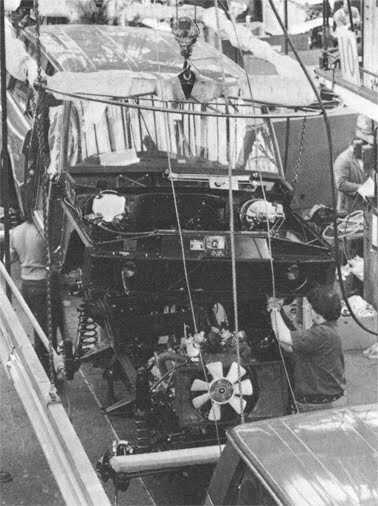 Finding a suitable engine might have been a problem but the then Managing Director, William Martin-Hurst, found the perfect solution when visiting an American engineering firm. 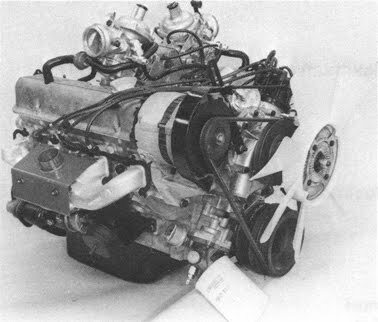 The engine he purchased was a 3.5 litre design, potentially very powerful, yet lightweight, being predominantly constructed of aluminium alloy. The American company had shown the engine to be very reliable, and had only decided not to proceed with it themselves because their production techniques were heavily committed to cast-iron technology - making aluminium an expensive alternative. Rover took the engine and considerably developed and modified it. This version is also used in Rover saloons, and has becomethe most important single power unit used by Rover. The designers' requirement for exceptionally good on- and off-road traction, combined with a high standard of ride comfort, was met by permanent four-wheel drive, and soft, long-travel suspension. These two features underly the whole Range Rover concept, and, together with an insistence on strength and durability, form the basis of its engineering design. 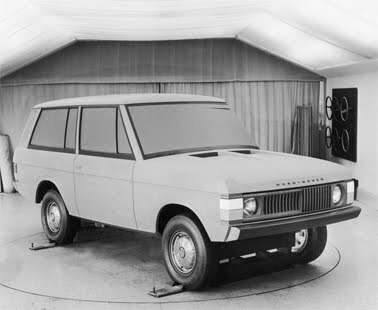 King and Bashford themselves drew up the basic body line, producing a bold, simple and essentially practical shape. Refinements by the styling team produced a very attractive vehicle, chosen as 'an outstanding example of modern sculpture' and exhibited in Louvre, Paris. 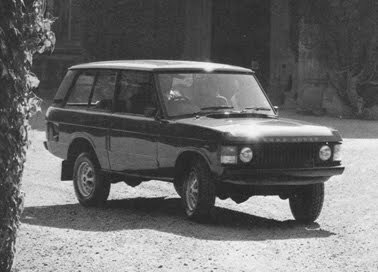 The Range Rover was successfully launched in June 1970. At that time, management felt confident in describing its versatility as 'four cars in one - a luxury car, a performance car, an estate car and a cross-country car'. It is a matter of history that Range Rover was received with tremendous enthusiasm and has subsequently fulfilled all these and many other roles with great success. For example, after exhaustive trials under all conditions, the Range Rover has been adopted by some European police forces as a fully equipped motorway emergency vehicle. 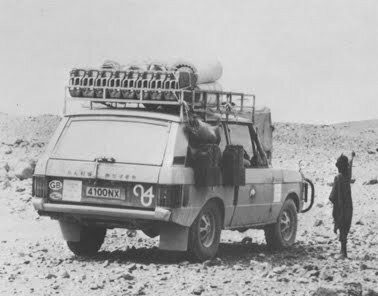 Range Rover exploits throughout the world have been well documented, but notable achievements of the vehicle include the complete traverse of the North, Central and South Americas from Alaska to Ushuaia in the southern-most tip of Argetina. This successful journey was undertaken by two Range Rovers. They were accompanied by a Land Rover for the infamous Darien Gap section, where for 250 miles there exist no roads of any kind, only jungle, swamps, rivers, and rough terrain. This was a feat which has yet to be repeated of surpassed. 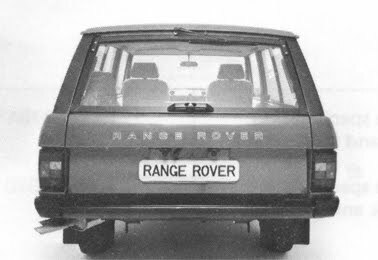 The Range Rover is constructed from a box-frame chassis, body sub-assemblies and external body panels. There are several advantages to this method of construction over the 'monocoque' structure of volume cars and of some competing four-wheel-drive models. The major advantage is that it provides rigidity against both torsonial and flexing stresses in rough and off-road conditions. The chassis is built from deep box section members, made from 2 mm (14 gauge) steel, and is welded throughout. This is a stronger construction than the usual open-channel section. The rear cross member is specially strengthened for towing. Chassis construction allows easy access to all mechanical parts for service or repair and provides protection for components, in particular, the petrol tank. 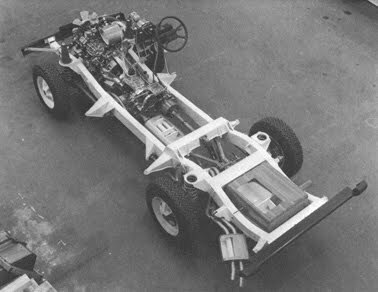 The body is mounted on the chassis at ten rubber-insulated points. Four rubber buffers provide additional support for the rear floor. The rubber absorbs sound and vibration and, on rough ground, allows some resilience in the movement between chassis and body. Despite its considerable load-carrying capacity, the Range Rover is a compact vehicle. This, together with the short overhang and high driving position, gives easy manouvrability and parking. The short overhang also gives good approach and departure angles which means that the Range Rover can approach and leave slopes or obstacles making an angle with the ground of up to 45 degrees front and 30 degrees rear, respectively. The vehicle body is made from both steel and aluminium. The body frame is made up of pressed steel sub-assemblies which are bolted together. The way that this forms a safety cage round the car's occupants. Onto this steel frame are bolted the outer panels. Most of these are made from 'Birmabright' aluminium alloy. This was developed for aircraft construction and is both tougher and structurally stronger than pure aluminium. Even if unpainted, it will not corrode in any weather conditions. The bonnet, tailgate and rear quarter-panels are made from steel, for additional strength. Most body panels are bolted on separately, so they can be easily removed for repair or replacement. 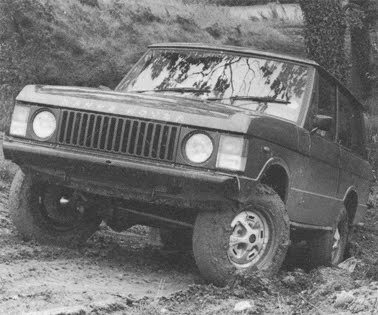 Despite its high ground clearance, 318 mm (12.6 in), except below the axles where it is 190 mm (7.5 in), the vehicle has a low centre of gravity because of the combination of heavy steel chassis and light body panels. This gives improved stability and handling especially on slopes. Because the Range Rover's body panels are bolted on, there is no welding heat in the final assembly process. Therefore the chassis and each body component can be thoroughly corrosion-proofed before the final assembly. - Dipped twice in alkaline bath to de-grease. - Dipped twice in zinc phosphate bath to etch prime. Coating penetrates all box sections, through specially drilled holes. - Rinsed in water to prevent further chemical action. - Electrophoretic dip, in which chassis is positively charged, the paint negative, so electrical attraction ensures every part of the chassis is coated with paint. - Electro-coated with grey primer. - Sprayed with acrylic paint. - All downward facing surfaces liable to be exposed to road splash are sprayed with black bitumen-based underseal to inhibit corrosion. Also acts as sound-deadening insulation. - It is unnecessary to coat aluminium as it is completely rust and corrosion free under any conditions likely to be encountered while driving. Painting is purely for appearances. - To improve paint adherence, parts are dipped in Alochrome primer. - At final assembly, sealant is intruded between steel/aluminium joints to prevent electrolytic corrosion between the two metals. The aesthetic lines of the Range Rover are the result of a well-integrated design based on functional considerations. A recessed band running through the side panels provides additional stiffness for the skin panels while protecting the side and tail lamps, the flush door pulls, and recessed petrol filler cap. It also lends a strong horizontal emphasis to the appearance of the car. The satin-black polyester finish to the grille panel, headlamp surrounds and bumpers is both stylish and scratch resistant. 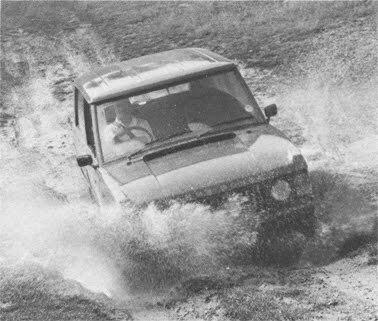 The front lower panel, being most vulnerable to damage in off-road operations, is made of resilient high density polythene. Badging in self-adhesive plastic tape material makes cleaning easier, and makes panel drilling for lettering unnecessary, further reducing the risk of corrosion. Big rubber mud flaps, fitted as standard behind the rear wheels, prevent mud and water being thrown up when off-road, and show consideration to other motorists when returning to the road. Recessed handles and lack of projections are designed to aid passage through thick scrub and bush. The front seats have been praised by doctors and leading motoring magazines for their orthopaedically correct (posture improving) design and consequent comfort. They have good fore and aft adjustment. 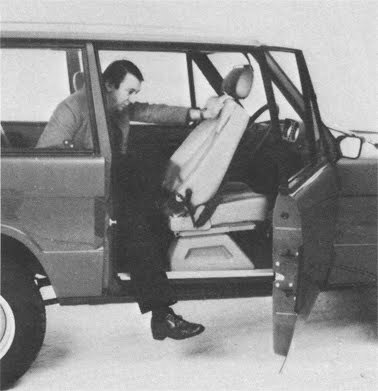 Head restraints are fitted as standard (1980 specification). The construction is also extremely strong, and the anchorage points can withstand a horizontal load of over 3.050 kg (3 tons); this means that the inertia reel seat belts, which are standard, can be fitted directly to the seat frame. This ensures correct positioning of the belt across the body in all seat positions, it stops it from obstructing access to the rear and prevent the belt from getting dirty. The high seating position, combined with good window design, gives excellent allround vision with little 'dead ground' in front of the vehicle. A great asset when negotiating difficult terrain or in heavy traffic. Easy access to the rear seats is gained by moving the backrest of the front seat forward, which automatically causes the whole seat assembly to slide forward on its runners. Normally, the backrests are held firmly in their upright position by one locking lever, which is duplicated at each side of the seat for convenience. Internal handles are fitted at the front and rear edges of the doors, thus allowing the doors to be opened easily from front or rear seats. For the safety of children, sliding security locks make door handles inoperative. The width of the rear seat is 1.4 m (58 in), and the legroom is 0.46 m (18 in). There are no intrusions from the wheel arches or transmission so three adults can sit in comfort. Again, the high seat position combined with large glass area gives excellent visibility. Anchor points are provided for rear belt harnesses. All seats are trimmed with Nutmeg velvet seat facings. The vinyl trim, Ambla, is still available as delete option. The velvet seat trim increases passenger and driver comfort, being warmer in winter and cooler in summer. It is also safer, reducing any tendency to slip on the seats during cross-country manoeuvres. Head restraints, which are also standard, have being restyled, and incorporate Nutmeg facings. 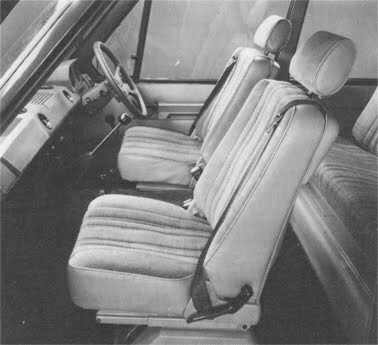 Both seats and the head restraints retain the Palomino-coloured Ambla surrounds and backs. The interior is further improved by the introduction of full-width, deep-pile Nutmeg carpets in both front and rear foot wells fitting over the existing rubber mats. The transmission tunnel is also carpeted, over a sound-deadening mat, as is the front half of each rear wheel arch. On the driver's side, the carpet includes a black rubber heel mat, and both front doors incorporate lower door trim panels covered in Nutmeg velvet. The four-spoke steering wheel is trimmed in grey leather, to match the fascia. The luxurious interior trim provides comfort for driver and passenger, but at the same time is hard-wearing and easy to keep clean. The load deck is covered with a hard-wearing, easy-to-clean, rubber mat. OPTION: Ambla vinyl trim is a delete option. Head restraints are not standard with Ambla trim; if required, they must be specified separately. The floor of the rear load space is made of corrugated aluminium and is covered by a removeable rubber mat, providing a non-slip surface for luggage or animals. Additional space can be provided by folding the rear seat forward, or by removing it altogether. The sparewheel is mounted vertically in a well on the left of the load area, which makes it easily accessible even when the vehicle is loaded. It is held to the body side by a clamp bolt and plate and has a black PVC cover. On the opposite side, protected by a cover, is a comprehensive set of tools and equipment. The tailgate is in two sections. The upper, formed by the window, has gas strut-assisted opening, and will remain in the fully open position during loading. The lower tailgate is made of steel and when open it forms a strong load-carrying shelf 0.7 m (27.6 in) from the ground. Extra long loads may be accommodated by leaving the tailgate open to give an extra 0.5 m (20 in) of length. Under these circumstances the illuminated number plate may be unclipped and hinged down so that it remains visible. The rear load space is sufficiently versatile to carry a wide range of loads. 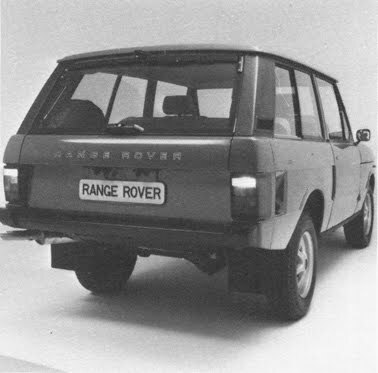 The designers of Range Rover took a well proven V8 unit and, by modifying and adjusting it to work well within its limits, produced a highly reliable engine with more han enough power throughout its range to carry out any task within the capabilities of the rest of the vehicle. careful attention to engine design details has ensured that the Range Rover power unit will always perform well, even under difficult conditions of terrain or climate. The maximum torque of the Range Rover engine is reached quickly, and remains high over the whole rev range, with a maximum torque of 251 Nm at 2.500 rpm (185 lbf ft at 2500 rpm). Maximum power is 97 kW at 5.000 rpm (130 bhp at 5.000 rpm). Torque is substantial through the range, reaching a maximum at the low figure of 2.500 rpm. This reduces frequency of gear changeing, particularly by giving unsurpassed traction at low revs, allowing easy driving in all conditions so avoiding driver fatigue. Many other features of the Range Rover engine makes it suitable for cross-country manoeuvres. The Zenith Stromberg carburettors maintain a steady supply of petrol on rough ground and give an excellent cold start ability down to a temperature of -29 degrees. The air cleaner/silencer incorporates a one-way drain valve to prevent accumulation of water and dirt which may enter while the vehicle is wading. The distributor and coil are situated high on the engine to reduce the risk of ignition becoming saturated by water. The lubrication and cooling systems have been designed to cope with extremes of temperature, vertical and horizontal accelarations and decelerations and roll. The alternator has a high output (65 amp) to allow for large loads to be put on the electrical system without risk of draining the battery. A split charge facility, using an auxiliary battery, is available as an option. The distributor, coil, water pump, oil filter and dip-stick are well-placed to allow good accessibility for inspection and servicing. A starting handle is provided as standard. 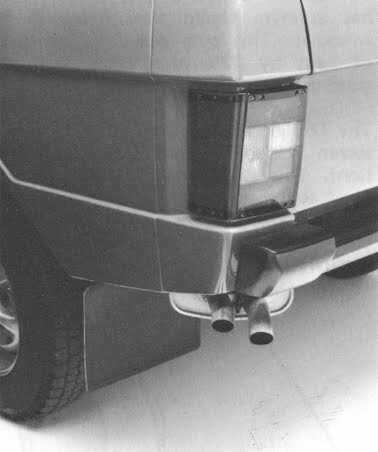 A twin-pipe, rear exhaust silencer is fitted, to give improved emission and noise characteristics, and by the same token, reduce the noise inside the vehicle. Acceleration is determined by engine power, torque and overall gear ratios. The Range Rover accelerates from 0-80 km/h (0-50 mph) in 10.1 seconds and its top speed is 155 km/h (96 mph). The fuel tank holds 81.5 litres (18 gal), giving a range of about 470 km (300 miles) in average driving conditions. The compression ratio of 8.13:1 allows the use of low octane fuels. Under normal conditions 90 octane fuel should be used, but in areas where this octane rating is not available, the vehicle can run on 85 octane fuel, provided the ignition is suitably retarded. The V8 engine gives good milage from low octane fuel, thus reducing running costs. The Range Rover has a total of eight forward and two reverse gears. This is achieved by means of a tough and reliable four-speed manual gearbox, associated with a transfer gearbox, situated to the rear of the main geartrain which can operate in high or low gear raios. The third differential is also locatedin the transfer gearbox. The transfer gearbox is a simple dog clutch, without synchromesh. It is therefore essential that changes from high to low gear ratio are only made when the vehicle is stationary, to avoid the danger of over-revving the engine. Changes from low to high may be made on the move, although this requires a little skill and should be practised before doing under difficult conditions. A power take-off facility is available in some specialist conversions. This is operated through the transfer gearbox, with the transfer gear in neutral. One of the outstanding features of the Range Rover is that the transmission embodies permanent four-wheel drive. By distributing power to all four wheels equally very good traction is achieved, enabling the vehicle to cover loose, slippery or uneven terrain with ease. On the road, four-wheel drive gives positive steering feel, with neutral handling characteristics and exceptionally good road-holding. A conventional car has a differential on the driven axle to allow the driven wheels to rotate at different speeds when cornering. A four-wheel-drive car will thus have two differentials, but in addition, allowance must be made for the front and rear wheels to follow different length paths through the corner. Thus, there must be a third differential between the axles to prevent overstressing of the transmission components and detrimental effects on fuel consumption and tyre wear. This is situated in the transfer gear box. Permanent four-wheel drive gives exceptional traction off-road, and improves the effectiveness of engine breaking. On-road the excellent adhesion is of particular benefit in bad weather. 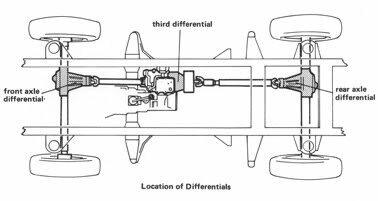 A normal axle differential has the disadvantage of allowing more power to be transmitted to the wheel which has the least resistance. So, if a wheel experiences no resistance, as may be the case on very slippery ground or if it is suspended in the air, it will spin freely nd eventually take all power, so that the vehicle loses traction. With a third differential this could mean that in extreme conditions all power would be transmitted to one wheel. To prevent this, a lock is fitted to the third differential which, when applied, ensures that each axle receives 50% of the power, so that even if both wheels on one axle spin, half the engine power will still be available for traction on the other axle. The differential lock can be applied when the vehicle is moving, but should be released as soon as good ground is gained, otherwise there will be unnecessary tyre wear and petrol consumption, together with transmission 'wind-up', and some steering difficulties. 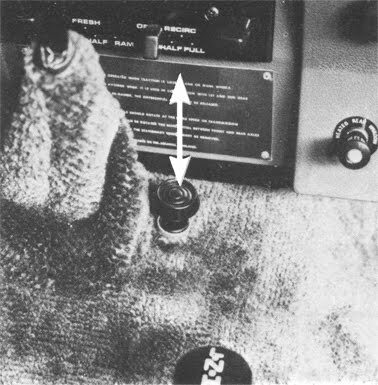 The lock is engaged by pulling a push-pull knob mounted alongside the gear lever. 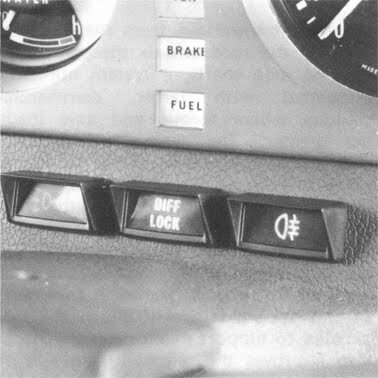 A warning light shows when the lock is engaged and this may remain on for some distance after the differential has been unlocked, as time may be needed for disengagement. If the third differential lock is inadvertently left engaged for some time, when driving over surfaces which do not allow wheel slip, it may prove difficult to release in the normal way. Under these circumstances the vehicle must be reversed, with the button puched to the unlock position. This will 'unwind' the transmission and disengage the lock. The continuous use of the differential lock is recommended when driving on ice, snow, sand or mud to give additional traction. Under these circumstances, normal wheel slippage will minimise the danger of transmission wind-up with the third differential locked. The final drive is through hypoid spiral bevel-type differentials, with a ratio of 3.54:1 at both front and rear. This particular construction gives good meshing and transfer of power, with quieter running. Power is transmitted from the differentials to the road wheels through fully-floating axle shafts, a system normally associated with larger, commercial vehicles where torque and axle loads are greater. The term 'fully-floating' means that the weight of the vehicle is taken directly on the wheel hubs, not by the axle shafts. This relieves the axle shafts of all shear or compression stresses, so that they need only withstand the torsional strass of transmitting the final drive to the wheels. The main advantage of this system is that it allows the suspension to support much more weight. It also improves the reliability and life of the final-drive components. An added advantage is that the shafts can be with-drawn quickly and easily in-service without jacking up the vehicle. Constant velocity joints, fitted to the front axle of the Range Rover, enable a smooth flow of power to be transmitted to the steering wheels, regardless of suspension movement or angle through which the wheels are turned, and avoid excessive transmission and tyre wear. In order to provide effective braking for a powerful and comparatively heavy vehicle, the Range Rover is equipped with large servo-assisted disc brakes on all four wheels. Disc brakes are less prone to overheating and hence to fading than drum brakes because their surfaces are more easily cooled by the air. Disc brakes have the added advantage in a cross-country vehicle of drying out rapidly after wading. 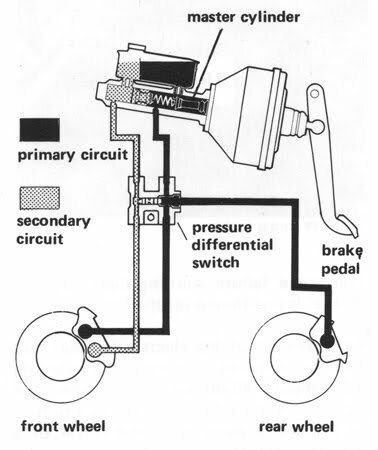 A servo mechanism multiplies the force which the driver applies to the pedal, so less effort need to be used to achieve a given braking pressure. Loss of servo does not render the brakes inoperative, but means that more driver effort is required to apply them. The front brakes are actuated by two independent hydraulic systems, so that if the primary system should fail a secondary curcuit is always available. Should there be any leak in the primary circuits the dual master cylinder ensures the maintenance of pressure in the secondary circuit. The pressure differential switch operates the brake warning lights if there is loss of hydraulic pressure in either system. A pressure-reducing valve is also fitted in the rear brake system. This proportionately reduces brake pressure in accordance with braking load. This ensures that there is no rear wheel lock-up when too much pedal pressure is applied and consequent loss of control. The valve is sealed and requires no servicing. The parking brake (handbrake) acts directly on the transmission, thus providing positive braking to all four wheels even on the steepest gradients. 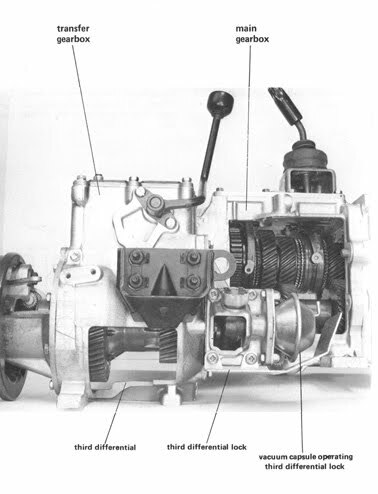 The brake is of the expanding shoe and drum type, and is positioned at the rear of the gearbox. The brake drum along with its short operating linkage is well protected by its high position in the chassis. There is no cables, as there are in a conventional handbrake system, to become caught up when crossing rough terrain. NOTE: The handbrake should not be applied when the vehicle is moving (except in emergency) otherwise the transmission will be damaged. The brake failure warning light, labelled 'Brake' is positioned on the fascia. As a check that the electrical circuit and bulb is working correctly the warning light should illuminate briefly when the ignition is switched on. Its function is to provide a warning to the driver of a loss of pressure in one of the two brake circuits or servo failure. In the unlikely event of failure of one circuit the brake pedal travel will increase considerably before braking recommences. With the loss of servo assistance, additional pressure will be required on the brake pedal to stop the vehicle. The handbrake warning light is no longer incorporated. 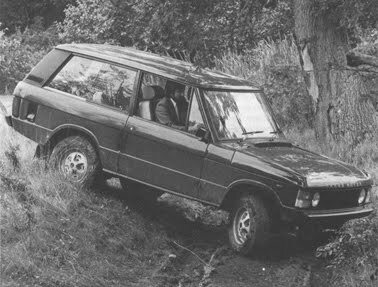 Experience with Land-Rover has shown that beam ales, because of their strength and simplicity, have a longer life, are less vulnerable to damage, and maintain a better ground clearance below the vehicle when crossing rough country, than an independent suspension system. On level ground, the clearance is 190 mm (7.5 in) under the axle differentials, and 318 mm (12.5 in) elsewhere, irrespective of load and ignoring tyre pressure. The suspension design of the Range Rover ensures that the vehicle body, and hence passengers and load, is largely insulated from the effect of varying road surfaces and rough terrain. The location of the front axle is by long forged-steel radius arms which, whilst allowing long vertical wheel movement, prevent any fore and aft movement of the axle. This therefore ensures maximum stability and positive handling characteristics when braking or accelerating. 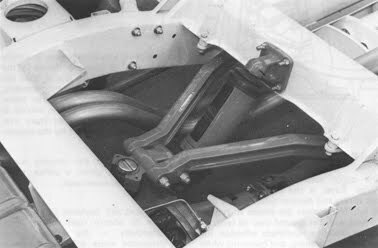 The transverse location of the front axle is by a Panhard rod. This further enhances the handling by ensuring that the axle remains centrally located when lateral forces are applied such as cornering. The location of the rear axle is by two tubular trailing links, which, like the front radius arms, prevent excessive fore and aft movements but allow long vertical wheel movement. The lateral movement of the axle is controlled by a centrally mounted 'A' bracket. The 'A' bracket consists of a pair of splayed 'H' section forgings, bolted at the apex to a ball joint mounting. Between the lower axle casing and the ball joint body is mounted a special Boge Hydromat ride-level unit. The major suspension feature of the Range Rover is the exceptionally long coil spring and damper travel at 203 mm (8 in). This enables the wheels to stay in contact with the ground over all types of terrain ensuring maximum adhesion for accelerating, braking, and cornering while giving a comfortable ride. 1. Longer spring can absorb greater shocks. The reason is, since energy is simply the result of force multiplied by the distance over which it acts, then the greater the suspension movement, the smaller the shock force transmitted. The body of the vehicle is therefore well insulated from irregularities encountered by the wheels. 2. 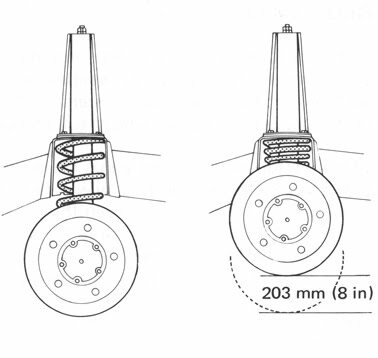 Longer springs can employ lower spring rates, giving a softer, more comfortable suspension. 3. The specially designed dampers are able to absorb road shocks more effectively - the energy being dissipated more efficiently over greater distance. Long coil springs and specially designed dampers keep the wheels in contact with the ground over rough terrain, giving better traction and handling. At the same time, they give very good absorbtion of road shocks and a softer suspension, resulting in a comfortable ride. The ride-level unit acts like a large damper, being energised by the vertical movements in the suspension system. The unit is sealed and requires no maintenance. The location of this unit is between the 'A' frame at the rear axle. Its function is to keep the body of the car level, (provided that the load is evenly balanced across the vehicle). If the vehicle or trailer is overloaded, the ride-level unit will detect this and not operate, hence the rear of the vehicle will remain down. Normally a vehicle which is designed to carry a heavy payload must have a rigid suspension which ensures sufficient reserves of vertical wheel movement when fully loaded. The Range Rover overcomes these problems by separating the two functions of the suspension. When laden, about 60% of the payload is carried by the rear axle, causing the back to drop. However, as soon as the vehicle is in motion, the ride-level unit comes into operation and restores the body to a horizontal position. The weight of the payload is thus largely removed from the coil springs which are released to absorb any shock to the wheels. 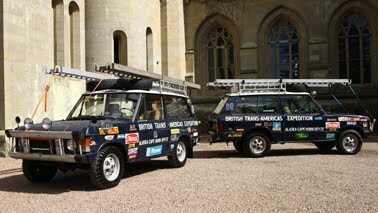 The Range Rover is consequently able to cross very difficult country in reasonable comfort even when fully laden. The ride-level unit largely relieves the coil springs from supporting the payload weight, and provides warning of overload. It gives a level ride under all load conditions, on difficult terrain, and when towing. Because of its popularity with customers, power-assisted steering is now standard in most territories. Manual steering is available as a delete option. By reducing the amount of effort required to turn the wheel, power assistance makes manoeuvring easier especially at low speed, and reduces driver fatigue. It allows the use of higher ratio steering system too, meaning fewer turns lock-to-lock (3.5 compared to 4.75 with manual steering). In helping to absorb sudden road shocks it also reduces the risk of steering wheel 'kick-back'. Range Rover employs an Adwest Varamatic power steering unit in which movements of the steering wheel acting through a rotary valve hydraulically assist turning of the road wheels. The progressive gearing does not eliminate road feel and maintains good straight-line stability. When driving straight ahead, the steering is relatively low-geared (though still a little higher than normal) but as the wheel is turned toward full lock, the gearing becomes progressively higher, thereby reducing the steering wheel movement required. Manual steering gives good road feel. The worm and nut gearing device is used in order to prevent excessive feedback to the steering wheel in off-road conditions. The recirculating ball system reduces friction between the rotating worm (attached to the steering coloumn) and the nut which moves along it, (transfering steering movements to the wheels via the tie rod), and hence gives longer life of the steering box. 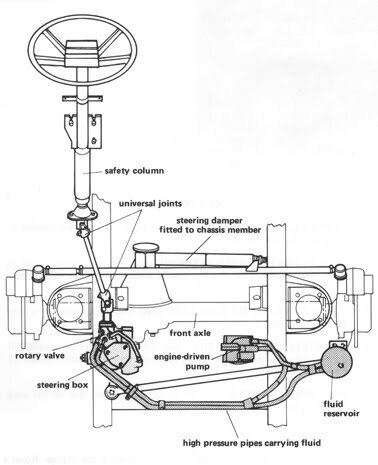 In both power and manual steering, the steering box is located well back from the front of the vehicle, and is therefore protected, by the chassis, from accidental damage. The steering system also incorporates a safety coloumn with two universal joints designed to collapse on impact in the vent of an accident. Off-road vehicles must incorporate a device fir reducing severe shocks imparted through the wheels to the steering. In many vehicles this adds friction, which, together with other factors like larger tyres, results in relatively low gearing (requiring large steering wheel movements). The Range Rover solves the problem somewhat differently. A special double-acting damper is incorporated to absorb forces created by impacts on the front wheels. On smooth surfaces, damper resistance is low and its presence is not felt in the steering. Only when the going gets rough does damper esistance increase. With a turning circle of 11.27 m (37 ft) the Range Rover is highly manoeuvrable for its length. Instrumentation which is clear and well-positioned makes an important contribution to safety. 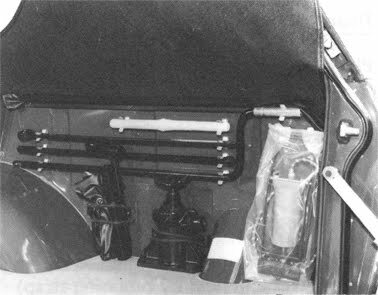 The instruments are split into two groups. Those which the driver refers to constantly on the road, such as speedometer, water temperature and fuel gauge are housed in a binnacle directly behind the steering wheel. The comprehensive warning light system is positioned here also. The secondary instruments which give further information on engine condition, are housed in the fascia of the central console. These comprise an ammeter, oil pressure and oil temperature gauges, together with an electric clock. The four-spoke steering wheel, giving excellent visibility, has thick, soft padding for optimum comfort and grip. Controls for auxiliary equipment, windscreen wash/wipers, direction indicators and so on, are placed on the steering coloumn adjacent to the wheel, for ease of operation and safety. The controls have been carefully designed and positioned to reduce driver fatigue and assist the speed of action in potentially hazardous situations. To increase comfort, the Range Rover has Sundym tinted glass fitted in all windows. This cuts down transmission of heat by 12% more than standard glass, and reduces glare. 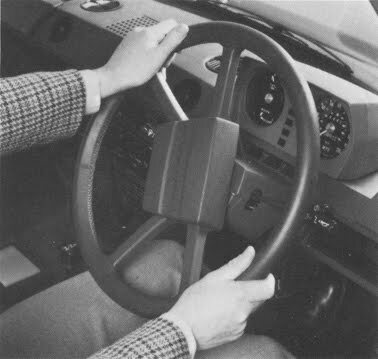 The Triplex 10/20 super-laminated windscreen is also standard (1980 specification). This windscreen is widely recognised as the safest yet available, and combines the advantages, while eliminating the disadvantages, of toughened and ordinary laminated glass. 10/20 contributes to safety in several ways. If damages by a flying stone, sufficient visibility is retained for the car to complete its journey. Should a more serious road accident shatter the windscreen, the plastic interlayer holds the glass together. However, unlike conventional laminated glass, the inner layer does not crack into long sharp splinters, but crazes into small blunt fragments with no sharp edges. The risk of facial laceration is therfore reduced to a minimum. Two-speed wipers, with a flick wipe facility, operate on the front windscreen, together with electrically operated windscreen washers. The heated rear screen has a separate wash/wipe unit operated by a tumbler switch on the fascia rail. Large, black-finished, anti-glare door mirrors are standard. Their size and style are well suited to that of the vehicle, and they give excellent rear visibility. Quartz halogen headlamps are standard fitting. They give a higher light output for a lower expenditure of power than sealed beam units, with the added advantage of simple replacement of the bulb. Quartz halogen headlamps give maximum night driving safety. Indicator lights are designed with other road users in mind. Rear light clusters show the vehicles full width and are clearly visible from the side. Repeater flashers are incorporated over front wheel arches. Rear guard fog lamps are fitted standard in most markets. The lamps may be operated in conjunction with headlamps only, and have their own warning light on the fascia. They also act as rear safety light in very dusty conditions. A third warning light, adjacent to the differential lock warning light, is illuminated to show side lights on. A hazard warning system is also fitted as standard. The ventilation and heating can be operated to cope with wide variations in climatic conditions. In hot weather, a 'high boost' volume of fresh air, drawn right through the passenger compartment and exhausted through the rear vents will completely change the air inside the vehicle every minute. Heating and ventilation ensure a comfortable atmosphere within the vehicle through a wide range of climatic conditions. By contrast, in cold weather, air already in the vehicle can be recirculated through the heater. In the 'demist' position, distribution of air is also directed to the side windows. The ventilation louvres in the rear quarter panels incorporate 'one-way' fiberglass cloth flaps. These allow the extraction of stale air when the vehicle is moving, but prevent the ingress of sand or dust.